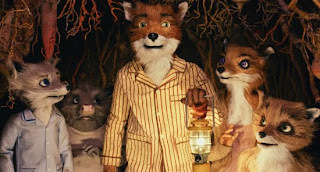 Fantastic Mr. Fox is one of, if not the, best movie I've seen all year. I generally don't stoop to this level of hyperbole when it comes to reviewing a move, but I would say that it could possibly be the best stop-motion anything I've ever seen. It's also Wes Anderson best movie in many outings. 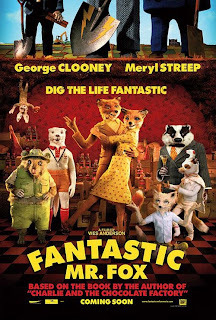 Fantastic Mr. Fox is essentially about an anthropomorphic Fox who's going through a mid-life crisis. Mr. Fox use to be a chicken thief, but when his wife became pregnant he was forced to give it up, and pick up a less risky job so as to provide for his family. After many years, he's middle aged; almost as old as when his father died. Faced with his own mortality he decides to begin stealing again. This act sets off the chain of events that changes his and everyone's lives in the forest. The overall plot is pretty basic and even cliche, what sells the story is animation and the heart that exists in these characters. Like all of Wes' movies the art direction is absolutely amazing. I'm not sure if an animated movie can be nominated for art direction, but this one should. It has all of the amazing early 70's retro touches that Wes is so in love with. This style truly suits Wes. His goal in his movies has always been to sort of create a living play. In this format he has complete control of everything. The Special effects are also great. It truly puts anything Aardman has done in years. It most akin to Paddington; this is actually signaled in a small shout-out near the end of the film. Because it uses this style it may seem rough when viewed by modern eyes accustomed to the smooth seamless movies made by CG characters, but for this story; and Wes' style it works perfectly. Thematically it deals with standard Wes Anderson fair: Life, Death, Trust, Awkwardness, and Family Relationships, or lack there of. This is probably the only Wes Anderson movie since Rushmore that hasn't had something to do with Suicide, but I suppose that's understandable considering it's a "Family" movie. It is a Family movie. It's not though the hermetically sealed, psychologist approved family affairs we've become accustomed too over the last 20 years of so. No, these may be clay figures, but they have heart, feelings they live they die, they alcohol. This reminds me of The Bad News Bears. It's the type of "Family" movie I though couldn't be made anymore. In short, it's a "Family" movie that has balls. The Voice Acting was spot on. I had some issue with George Clooney at first. His voice is so recognizable, I had some issue matching it to Mr. Fox. As the story got deeper though I actually forgot it was George Clooney, I actually saw Mr. Fox as James Gardner or Carey Grant. A more old Hollywood archetypal leading man. The other standout performance is Jason Schwartzman as Ash, Mr. Fox's son. The reason it's so great is because he's essentially playing Max Fisher. A younger Max Fisher, but still Max Fisher. It's great to see the character in a different setting. In the end this is a great film. I definably recommend it for anyone. Also, look out for the Wolf Scene it will make your week.